This article was originally written on June 23rd 2011. As there was some discussion of subscription forwarding on nanomsg mailing list, I am republishing an enhanced version of the article it in this blog. In the beginning you have the distribution tree, the messages flow from the publisher to each subscriber. The ultimate subscribers may choose to drop some of the messages. That's how it's implemented in nanomsg at the moment. Then, some parts of the tree may implement local optimisation by subscriber letting the publisher know that it won't need some messages. 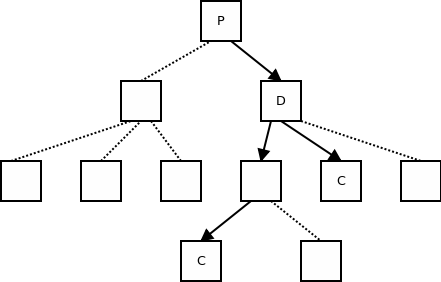 Looking at the problem from this point of view is pretty useful, as it allows us to think of multicast parts of the tree not as some kind of oddity, but rather fully standard nodes which happen not to implement the optimisation. Sometimes, we don't want to match using a prefix of the message, as it is done in both ØMQ and nanomsg. Instead, we would like to match using regular expressions, SQL-like queries of whatever other matching mechanisms you can think of. This functionality was part of Crossroads (now defunct fork of ØMQ) and should be taken into the consideration when standardising the SP PUB/SUB protocol. Note that treating the subscription forwarding as an optional optimisation allows the system to ignore subscriptions of unknown types and treat them as "send me everything" subscriptions. PUB/SUB allows for multiple publisher/single consumer topologies. What it means is that the subsription are sent to multiple destinations. At the same time, the mechanism for passing subscriptions has to be fully reliable (losing a subscription is not an option as it would result in faulty business logic). And as I've tried to explain in many places reliable transmission to multiple destinations is possible only if you accept the fact that a slow/stuck/hung-up destination can cause the whole distribution tree to slow down or grind to the halt. Obviously, we cannot accept that in PUB/SUB protocol. Don't allow more that one publisher per subscriber. If there's more than one publisher, turn the subscription forwarding off. Allow for forwarding subscriptions only one hop upstream, thus limiting the possible damage to a single tier of subscribers. One solutions that is typically mentioned is "kill the connection to the slow/hung-up publisher". The problem with that is the connection will be re-connected in a short time and then all the subscriptions will be resent, making the congestion situation even worse (you can think of it as a connection-based equivalent of retransmit storm). One solution that looks like it may work is to limit the number of subscriptions from a single consumer to a small number (say 32) and subscribe to the full message feed if any further subscription is issued.